Declining trees often reveal their illness by way of visible symptoms. Leaves changing color too early, branches that are bare at the tips, and obvious deadwood are just a few indications that a tree is struggling. A homeowner can often determine that a tree maintenance consultation is needed. For example, trees of the same species usually change color and drop their leaves around the same time. If a homeowner has three birch trees in his or her yard and one begins to significantly change in color before the others, the homeowner can deduct that the tree most likely has some health issues and schedule a free consultation. Visible signs of insect infestation (eaten leaves, bore holes, actual insects). Please Call 704-366-1134 or SCHEDULE AN APPOINTMENT on-line with an AAA TREE EXPERTS Arborist. We will do a complete inspection to determine if a course of action is required. A consultation with our arborist is FREE OF CHARGE. Start by inspecting your trees for damage after a recent ice or snow storm. Trees may show new damage or worsening of old damage after heavy snow and ice. Look for holes in the trunk, cankers, cracks, numerous dead or weak branches, and especially for insect infestation and diseases. If you notice any of the aforementioned damage – call our arborist today. We will inspect your trees, remove all weak and diseased limbs and branches, and perform pruning and fertilization to boost your trees’ health and strength. We can thin overgrown shrubs in order to let some light into the middle of the plant. Your trees and shrubs are dormant right now, but the late dormant season is actually the best for pruning for some species; the wounds from pruning are left uncovered for only a short time before new growth in the spring begins the sealing process of the wound. Moss can make trees less attractive, weaken and add weight to branches, and choke off new twig growth. De-mossing is the process of climbing trees and physically removing moss, and should only be done by a certified arborist to avoid hurting your trees and to save foliage that may be lost if not performed properly. We have the right tools and equipment to reach all branches of the tree to remove Ball or Spanish moss. We offer a FREE CONSULTATION to determine the best method of de-mossing (hand removal or chemical spraying) for your particular situation. The chemical spray we use is safe, will not harm your trees, and may even provide additional benefits to your trees. Photo of Ball moss was taken by Kohlnf. Amend the soil where your tree and shrub roots exist this fall. We often mistakenly think of fertilization as something that should only be applied during the active growing season when in reality roots are currently taking up nutrients that will help them to resist disease and maintain vigor. Excess nutrients are stored and immediately available in the spring which is highly valuable to the tree and reduces the chances of stress which in time can lead to decline, failure, and death. AAA Tree Experts uses a combination of worm castings (extremely nutrient rich) as well as a Sea Kelp fertilizer. We don’t bombard your trees and shrubs with excessive amounts of nitrogen which can be more harmful than helpful. Charlotte seems to be the land of the overgrown willow oaks.These are a faster growing oak that often has poor attachment points and we frequently see willow oak branches or whole trees fail. Cambistat is a plant growth regulator that can increase the chance of coexisting with your mature tree for an extended period of time. It can also lessen the frequency of needed pruning, which is kind of a bummer for our climbers, but good for your pocket book. Tubakia (Actinopelte) Leaf Spot is a late-season (August, September) infectious leaf disease of oak trees. The initial symptoms of Tubakia leaf spot are dark brown or reddish-brown spots on leaves. Spots can appear on leaf veins, which can lead to the death of the veins and collapse of leaf tissue, resulting in the early defoliation of oaks. These are not to be confused with the symptoms of oak anthracnose, which develops earlier in the season (May, June). But don’t worry, in most cases Tubakia Leaf Spot leaves the tree looking rugged, but will not kill the tree. Please DO NOT attempt to use fungicide sprays to try and combat Tubakia leaf spot. 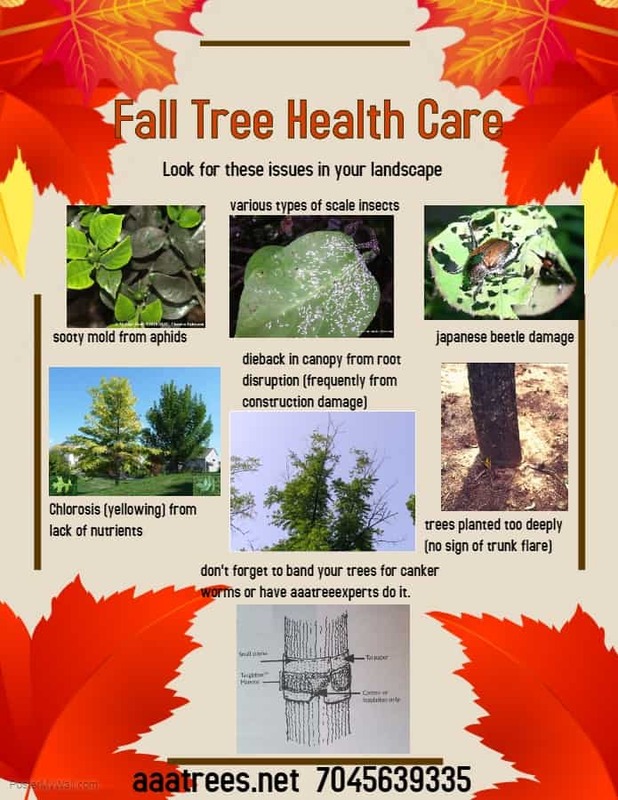 You can reduce the number of spores that cause this disease by removing and disposing of fallen, infected leaves (via burying, burning or composting) and watering and fertilizing trees appropriately. The Twig Girdler is a beetle (gray to brown colored longhorned beetle with a gray stripe across the wing) that usually emerges from late August to early October. Small populations aren’t cause for big concern, but left untreated, these beetles can multiply into a full infestation and cause serious damage. Twig Girdler beetles girdle (cut away) twigs and small branches causing the injured portions to break away or hang loosely on the tree. The ground under infested trees is usually covered with twigs. As a result of this beetle infestation, nut/fruit trees often end up with lower yields for years. What do you do? Natural control is usually the best. Severed twigs on the ground and those lodged in trees should be gathered and destroyed during the fall (when the females are laying eggs), winter, and spring when the eggs and grubs are still in the twigs. This way infestation can be greatly reduced in one or, in moderate cases, in two seasons. If debris infected with pests or disease is not disposed of, it can infect your trees again, or spread to surrounding trees. Twig Girdlers can be treated with systemic products that are consumed when the insect feeds on the tree. However, females don’t feed on the tree tissue, and can be very difficult to control. If you notice small tips of branches on your trees suddenly turning brown and breaking away, call us. Our certified arborists can recommend a plan for reducing the twig girdler population and further damage to your trees. Leaning trees should always be a cause of concern in the landscape of your property and need immediate assessment by a certified arborist experienced to determine the root system’s structural integrity. Most trees that are leaning have limbs that are uneven or too many growing on one side of the tree. Poor tree planting, planting trees in a windy corridors, root structure damage, and construction or soil heaving are causes of a leaning tree. Sometimes, natural disasters (hurricanes, ice storms, tornados) can cause tree leaning. We can straighten young leaning trees by digging up part of the root, making sure to limit any root damage, then replanting it at the correct angle. Then we stabilize it using a special brace. When your tree is stabilized, we will add the right amount of mulch, root stimulator and thoroughly water it. We also have methods for correcting large leaning trees. We can temporarily support a tree until its root system is established enough to support it alone. Evaluation by a professional arborist is the best way to deal with a leaning tree situation. We can perform a tree removal if the situation warrants it.